Put away the shovel if you need to mix more than one or two bags of concrete or mortar mix. An electric mixer does a better job than you can by turning the concrete in a wheelbarrow, and it's far less work for you. Electric mixers can handle about three bags in a single go, and you can usually rent one at a local rental outlet. If you need to mix more than three bags at a time, you need a gasoline- or diesel-powered mixer, but the mixing procedure is essentially the same. The most important thing to remember is to clean the mixer after each batch because dried concrete is virtually impossible to remove from the mixing fins and barrel wall. If you're using more than a few bags of concrete, your back will thank you for using a mixer. 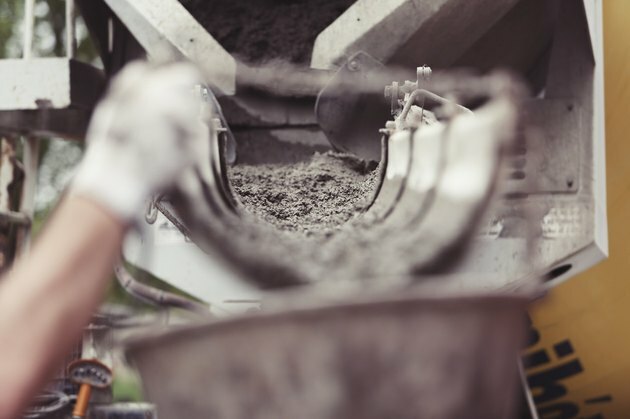 You may be using ready-mix concrete or making your own using Portland cement, sand and aggregate. Either way, the amount of water you add is critical. Too little, and the mixture won't be workable, but too much, and the concrete won't be as strong. By adding too much water, you can reduce the strength by as much as 40 percent. In general, you should add 3 quarts of water for every 80-pound bag of ready-mix and 2.5 quarts for every 60-pound bag you use. Concrete mixes differ, so it's always a good idea to check the water proportions on the package. When making your own mortar mix follow the 1:2:3 rule —1 part water, 2 parts cement, and 3 parts sand. If you're planning to add aggregate to your concrete mixture, follow this rule: 1 part cement, 2 parts sand and 3 parts aggregate. Then add water in the same proportion you would for ready-mix: 3 quarts for every 80 pounds. After towing your mixer onto the job site, position it on level ground. Block the wheels to prevent it from moving. You don't want it to tip when you're mixing the concrete or pouring it into your wheelbarrow. Get all your tools ready so you can use the concrete as soon as it is mixed. Fresh concrete begins to stiffen in about an hour. Pour about half the water you need into the mixer, then add the required number of bags of ready-mix concrete. Most electric mixers can handle up to three 80-pound bags. Check the specifications on yours to determine whether it can handle more. If you're mixing your own concrete, add a small amount of water to lubricate the mixer walls and add the dry mixture in the proper proportions. Turn on the mixer and let it run for about a minute, then slowly add the rest of the water. It's a good idea to add a little less water than you need to avoid over-watering. Let the mixer run for about 3 to 5 minutes until the concrete achieves a uniform consistency. Turn off the mixer and check the consistency by removing a handful with your gloved hand. It should be moist enough to easily form into a ball without crumbling, while still being firm enough to keep its shape. Turn the mixer back on and add more water in small increments if the concrete is too dry. Once the concrete has achieved the proper consistency, it will easily pour out of the mixer when you tip it. If it doesn't do this, it needs more water. Clean the drum thoroughly with a hose after you've poured all the mixed concrete into a wheelbarrow. Be sure to get all the material stuck in the corners between the mixing fins and the barrel wall. 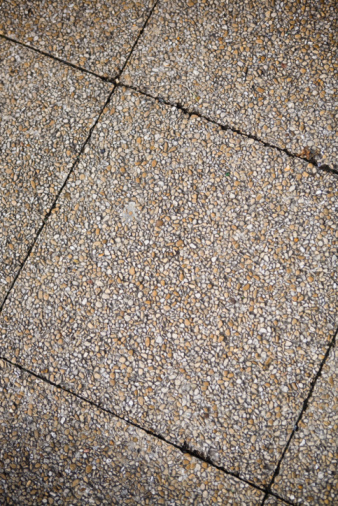 Can I Use Quick-Set Concrete in the Rain?